Pathological accumulation of abnormally phosphorylated tau protein in astrocytes is a frequent, but poorly characterized feature of the aging brain. Its etiology is uncertain, but its presence is sufficiently ubiquitous to merit further characterization and classification, which may stimulate clinicopathological studies and research into its pathobiology. 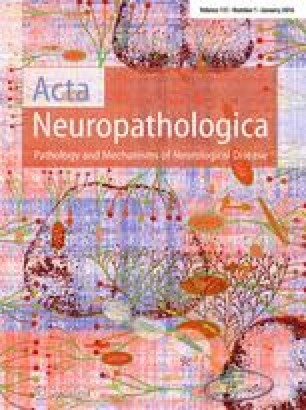 This paper aims to harmonize evaluation and nomenclature of aging-related tau astrogliopathy (ARTAG), a term that refers to a morphological spectrum of astroglial pathology detected by tau immunohistochemistry, especially with phosphorylation-dependent and 4R isoform-specific antibodies. ARTAG occurs mainly, but not exclusively, in individuals over 60 years of age. Tau-immunoreactive astrocytes in ARTAG include thorn-shaped astrocytes at the glia limitans and in white matter, as well as solitary or clustered astrocytes with perinuclear cytoplasmic tau immunoreactivity that extends into the astroglial processes as fine fibrillar or granular immunopositivity, typically in gray matter. Various forms of ARTAG may coexist in the same brain and might reflect different pathogenic processes. Based on morphology and anatomical distribution, ARTAG can be distinguished from primary tauopathies, but may be concurrent with primary tauopathies or other disorders. We recommend four steps for evaluation of ARTAG: (1) identification of five types based on the location of either morphologies of tau astrogliopathy: subpial, subependymal, perivascular, white matter, gray matter; (2) documentation of the regional involvement: medial temporal lobe, lobar (frontal, parietal, occipital, lateral temporal), subcortical, brainstem; (3) documentation of the severity of tau astrogliopathy; and (4) description of subregional involvement. Some types of ARTAG may underlie neurological symptoms; however, the clinical significance of ARTAG is currently uncertain and awaits further studies. The goal of this proposal is to raise awareness of astroglial tau pathology in the aged brain, facilitating communication among neuropathologists and researchers, and informing interpretation of clinical biomarkers and imaging studies that focus on tau-related indicators. We are extremely grateful to the patients, clinicians, and fellow researchers that made this effort possible. We also acknowledge the following funding sources: FP7 EU Project Develage No. 278486 (GGK); Grant “NIH P30 AG10133 (BG); NIA Grants P50 AG05681, P01 AG03991 (NJC), NIH R01 AG040311, institutional Grants NIH P01 AG019724-03 and P50 AG023501, and the tau consortium (LTG); the Nelson Family Foundation (MEM) and NIH Grants P50 AG016574 and P50 NS072187 (MEM, DWD); NIH Grant AG010124, AG017586 (JQT); NIH Grant P50 AG005138 (PRH); Alzheimer’s Research UK (ARUK), Alzheimer’s Society, National Institute for Health Research (NIHR), and UK Medical Research Council (MRC; G0400074) (JA); GMH is a National Health and Medical Research Council of Australia Senior Principal Research Fellow (#630434); Grant IGA NT12094-5 from Grant Agency of Ministry of Health of Czech Republic (RM); NIH Grant # AG028383 (PN); UK Medical Research Council (MRC; MR/L016400/1) (CS); NIA P50 AG005133 (JK); National Institute of Neurological Disorders and Stroke (1U01NS086659-01), Department of Veterans Affairs,), the National Institute of Aging Boston University Alzheimer’s Disease Center (P30AG13846; supplement 0572063345–5) (ACM); UK Medical Research Council (MC-PC-13044) (JWI and CS); National Brain Research Program, Hungary (KTIA_13_NAP-A-II/7) and Grant-in-Aid (KAKEN 26250017) (both for TH); NIH Grant P30AG12300 (KH, CLW); Ministerio de Ciencia e Innovación, Instituto de Salud Carlos III—Fondos FEDER, a way to build Europe FIS Grants PI14/00757 and PI14/00328 (IF); DFG Grant (SFB 1134/A03) (CS); Johns Hopkins Alzheimer’s Disease Research Center NIH Grant #P50AG05146 (JCT); Alzheimer’s Disease Core Center Grant P30AG008051-26 (TW); Grant AG13854 (EHB); JSPS KAKENHI Grant Number 26430060 (MT); Italian Ministry of Health (GG and FT); National Institute of Health Grants P50 AG05136 and P50 NS062684 (TJM). The help of Brain Banks in collecting tissue is also highly acknowledged: Vienna KIN-Neurobiobank and VITA–study (GGK); GIE NeuroCEB (funded by the patients associations France Alzheimer, France Parkinson, Fondacion ARSEP and CSC) (CD); Sydney Brain Bank (funded by Neuroscience Research Australia and the University of New South Wales) (GMH); the Sheffield and Cambridge Brain Banks (CFAS) (PI, SW); Parkinson’s UK Tissue Bank at Imperial College, funded by Parkinson’s UK, a charity registered in England and Wales (948776) and Scotland (SC037554) (SG); The Edinburgh Brain Bank is supported by the UK Medical Research Council (MR/L016400/1) (CS, JWI).